Looking for a unique item to give to customers? 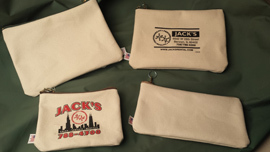 Jack's now offers zippered canvas bags that can be customized with graphics or logos. Scroll down for samples and pricing. Note: Bags delivered with random colored zippers unless otherwise specified.